Chance Time is one of the features in the first Mario Party game, where players could change the course of the game a little, or even totally. All they had to do was land on the Chance Time Space to play. The players have to hit three orange blocks to decide what will happen. Two of the blocks have pictures of all four players' heads, and the one in the middle shows what they are swapping (coins or Stars). The players can hit the blocks in any order, but whatever the order, the remaining blocks spin faster with each block hit. In Mario Party 2, the way it is played is remains the same, but with a few aesthetic changes, along with giving three coins (now the lowest to give coin-wise) as well as the introduction of trading both coins and stars as additional options. Also in Mario Party and Mario Party 2, Bowser has his own Chance Time event appropriately titled Bowser's Chance Time. This game can be played by landing on a Bowser Space and having Bowser's event roulette stop on this option. It is played the same as regular Chance Time, except the block on the right always displays Bowser's face and every option on the middle block results in something being given to Bowser. 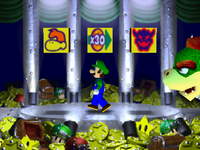 However, the players cannot lose one of their stars; only coins can be given to Bowser. Both the left and the middle blocks also spin extremely fast instead of getting gradually faster like in the regular Chance Time. In Mario Party 3, the event is still called Chance Time, but gameplay is slightly different. Players have to hit a ! Block to stop the pictures on the mushroom slot machine in the back from spinning to determine the outcome. On the left shows the player who is giving something away, and on the right shows the player who receives the prize. The bottom shows the prize itself (again, coins and Stars). Instead of the player choosing, however, the computer randomly chooses the order, with the first slot spinning slow, the second spinning faster, and the third spinning extremely fast. In Mario Party 4, the game's name is changed to Reversal of Fortune. Here, players choose two players and what they are swapping, but by pinball. Holding down the pulls the shooter farther away, and the button releases the pinball. Wherever the pinball lands decides the outcome. Also, tiny Koopa Kids are in the way to knock the pinball off-course. The order in which the different variables (giving player, receiving player, and what items are at stake) are selected is now fixed: first the giving player, then the receiving player, and finally the items. The items are trade coins, give 20 coins to the receiver, trade both coins and stars, give one or two stars to the receiver, or trade stars. 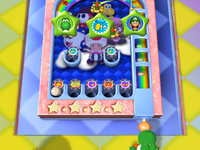 In Mario Party 5, the event is called Chance Roulette, and is is activated by the effect of a Chance Capsule (either by using it or by landing on a space where one has been placed). The mini-game itself has been changed again; the player must hit a ! Block to stop a roulette similar to Mario Party 3, but who is involved and the outcome is determined in the fixed order seen in Mario Party 4. In Mario Party 6, the event once again has a dedicated space, called Miracle Spaces. The event is now called Round of Miracles. The event itself is extremely similar to Mario Party 5. In a team battle, nothing happens if the giving and receiving players are on the same team. 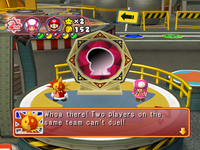 The Chance Time feature and the Fortune Space do not reappear in the later Mario Party games, seemingly being replaced by the new mechanics of Duel Spaces, which now involve a similar roulette. The box art for Mario Party shows a Chance Time die with Luigi, Bowser, and Star symbols. However, it is not possible for a Chance Time die to have all these symbols at once. There is a die for the playable characters, a die for Stars and Coins, and a Bowser-only die that's exclusive to Bowser's Chance Time. This page was last edited on December 3, 2018, at 18:37.